The region's propensity to build, coupled with its dedication to real estate, has created an unequal present for its residents. But that can change. This is the first of a two-part series in conjunction with D Magazine’s new urbanism special issue, which begins publishing online Monday. This story looks at how thinking around urban planning has created the city of Dallas we know today. The new urbanism issue explores how Dallas can design itself for residents instead of commuters. Modern Dallas was born in May 1908, when, after three days of torrential rain, the Trinity River overflowed its banks and washed out bridges, railroad trestles, neighborhoods, and sections of downtown. Dallas’ leadership was confronted with a problem familiar to all fast-growing cities: how to protect the city’s rapid growth against the powerful and fickle forces of nature. Their response to that question would shape Dallas-Fort Worth for the next 110 years. First, in 1911, Dallas’ leadership commissioned celebrated urban planner George Kessler to organize Dallas’ chaotic urban layout. Since the arrival of the railroad in the 1870s, the booming frontier trading depot had evolved into a messy tangle of partially cobblestoned streets, muddy alleys, circuitous streetcars lines, interlacing railroad tracks, and two overlapping and incongruous street grid systems. The planner made numerous recommendations, but his most significant was to direct Dallas to move the Trinity River away from downtown. It took more than two decades to accomplish, but when the river was finally moved, it transformed the former floodplain into cheap land primed for development. 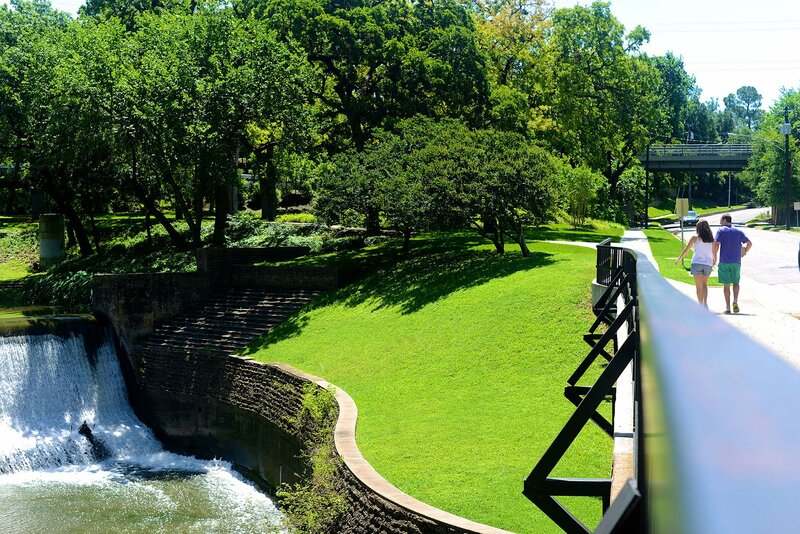 Private landowners donated some of the land to the federal government for the construction of Interstate 35, and what was once a river became Dallas’ new industrial center. The flood of 1908 taught Dallas an important lesson: a planner’s vision could instigate public investment, which in turn could open raw land to economic benefit. For the next hundred years, cities and towns throughout the region repeated the experiment, building out an ever-expanding network of superhighways, extending the machinery of urban infrastructure into the vast emptiness of Texas farmland. Acres of cotton fields and cattle ranches became an unbroken, unbounded stretch of concrete. Planners, as well as legions of architects, engineers, governmental bureaucrats, real estate developers, politicians, and civic boosters, worked together to build a new kind of urban environment, an urban super region that grew to become the fourth largest metropolitan area in the country with a GDP that is greater than that of Sweden. But there is another side to the region’s success. 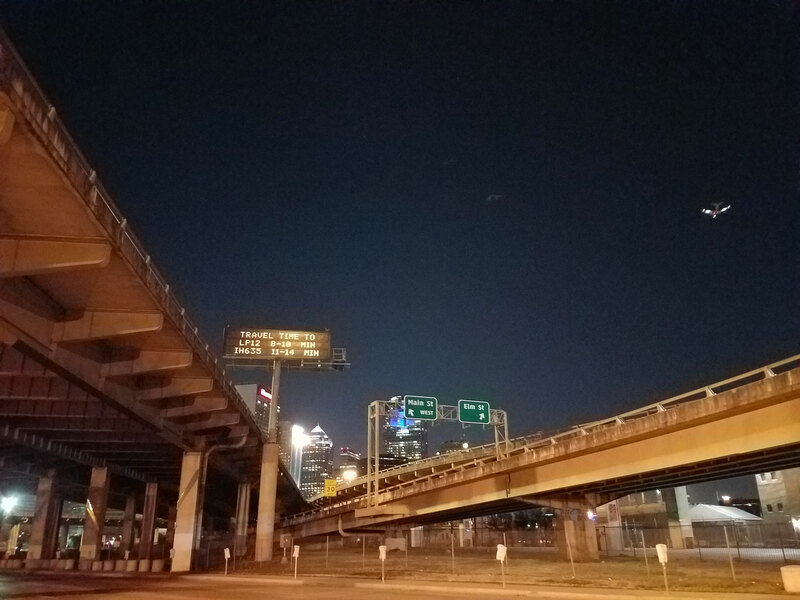 I-345, the stretch of highway dividing Deep Ellum from downtown and connecting interstates 75 and 45, is at the center of debate on how to develop the city’s urban core. Photo by Alex Macon. Today, Dallas-Fort Worth is home to massive income inequality, and the city possesses one of the highest rates of childhood poverty in the nation. While some DFW communities spend millions of public dollars to lure corporations and sports franchises to their corners of the region, others can hardly afford to maintain basic infrastructure or provide satisfactory public education. The distance between job opportunities and affordable housing grows ever wide as governments dump billions into an ever-expanding highway network that is increasingly congested. Some DFW communities look like the very ideal of 21st American success; others could be mistaken for the poorest corners of Appalachia. Dallas has become, as architecture critic Mark Lamster labeled it, “Paradox City, U.S.A.” And yet, most of the region’s civic leaders see these paradoxes as discrete social, political, cultural, economic, or environmental challenges. Instead, the region’s incongruous image of success is a canary-like indication that DFW’s strategy for growth is fundamentally unsound. It is a threat that is no less existential than that terrible flood that nearly wiped out the city in 1908. To understand why these many “paradoxes” exist and the threat they represent, we must first understand how Dallas-Fort Worth came to be the kind of urban environment it is today. It is a story that challenges our basic assumptions about how North Texas does business and shows how those assumptions are rooted in the systematic application of radical, unproven ideas about how urban societies should operate and function, the biproduct of a brand of 20th century urban idealism that has fundamentally altered the structure of urban policy. Only when we can see that the status quo of DFW’s urban development is the legacy of a failed urban experiment can we begin to understand how the region may reverse a century of mistakes. The first automobile arrived in Dallas three years before George Kessler. At first, the new car was viewed as a novelty and a safety nuisance. The city passed ordinances to help protect pedestrians from the motorized buggy. But as cars flooded the market, Dallas paved streets. Suddenly, there was untapped value in land that was previously not accessible by foot or streetcar. The automobile has long served as a shorthand explanation for Dallas’ 20th century growth. But it is overly simplistic to see suburban sprawl as merely a deterministic outcome of the introduction of the car. Rather, it is more helpful to focus on the figure of Kessler, not necessarily his plan for Dallas, but what Kessler-the-Planner represented to Dallas’ ambitious imagination. When Kessler arrived in Dallas, he was more than an outside expert. Kessler symbolized a new kind of hope, an optimism and enthusiasm for big ideas that could revolutionize the way cities work. Large-scale urban reconfigurations in the 19th century, like the kind that gave birth to Washington D.C. or dramatically redrew the geography of Paris, inspired 20th century planners to believe they could cure cities’ ills by radically reinventing urban form. New and influential schools of thought – Charles Mulford Robinson’s City Beautiful, Ebenezer Howard’s Garden City, Le Corbusier’s Radiant City – varied greatly in methodology and approach, but they each shared a fundamental desire to clarify urban life and separate urban functions in order to keep the “messy” aspects of urban life – commercial, manufacturing, and industrial uses – away from the kindlier ones, like housing and parks. Kessler was a well-respected practitioner of the City Beautiful movement, and his recommendations for Dallas included the development of Union Station and Dealey Plaza as grand ceremonial entryways into the burgeoning city. Dallas only implemented parts of Kessler’s plan but swallowed whole an enthusiasm for master-planning as a municipal medicine. Over the course of the next century, Dallas would continually invite dozens of the most celebrated urban planners of their day to draft scores of plans that, like Kessler’s, were only haphazardly implemented. Dallas’ many plans may have never fully materialized, but they did serve a function. Urban planning provided a kind of intellectual cover, a reasonable, civic-minded justification for new investments of public funds into infrastructure improvements that appeared to reflect planners’ intent and ideals, but which instead followed the logic of a deeper guiding principal. This logic was forged by the emerging image of an idealistic American life and the evolved bureaucratic machinery operated by new forms of governmental administration. Beginning in the 1930s, a new ideal of the American city emerged as a utopian dream of a spectacular and futuristic elevated highway system that established an interconnected network of suburban homes. This image entered the public imagination in the form of advertisements, like the General Motors-sponsored Futurama exhibition at the 1939 Worlds Fair, and mass media, like Leave it to Beaver. Look at all this greenspace. Aren’t parks great? Photo by Kristi and Scot Redman. Meanwhile, public investment was directed towards infrastructure that could turn these visions into reality. The most visible public investment was the establishment of the interstate highway system, but other new policies were just as transformative. The 1949 Housing Act, for example, provided funds for the large-scale clearance of city neighborhoods, while introducing long-term, fixed-rate fully amortizing mortgages that fueled the post-war housing boom. State, regional, and municipal government agencies invested in a wide array of infrastructure projects – sewers, electricity grids, telephone networks, and myriad networked services and amenities that critic Lewis Mumford dubbed “the invisible city” – underwriting a half-century of economic inertia away from dense city districts towards suburban urban forms. In the 1930s, architect Frank Lloyd Wright predicted that the introduction of new transportation and communication technologies would make the centralization of cities obsolete. The growth of Dallas-Fort Worth after World War II appeared to prove him right. North Texas provided an endless supply of empty farmland upon which a version of the dream of Wright’s Broadacre City – the decentralized city – could be written in concrete. Whenever a new road was constructed, new communities sprung up out of the empty dirt like magic. The city that had cut its teeth on cotton and came of age with oil discovered a new generator of easy dough: real estate. Dallas’ political and business leadership were well-invested in the model that seemed to produce limitless new economic opportunity. In the 1960s, under Mayor J. Erik Jonsson’s Goals for Dallas plan, the city cemented its commitment to regional growth. A new research university, the University of Texas at Dallas, would be built on empty pastures on the outskirts of town in Richardson. A new tollway authority would dart toward the Red River, turning northern suburbs into booming clusters of corporate campuses. And on a Manhattan-sized stretch of mesquite-covered prairie located halfway between Dallas and Fort Worth, the region would lay its claim as a global economic center with the construction of Dallas-Fort Worth International Airport. Between 1950 and 2000, Dallas-Fort Worth’s population grew by nearly 1,000 percent. But as DFW grew, downtown Dallas emptied, and the surrounding neighborhoods fell into disrepair. The city responded by razing entire blocks of old commercial buildings and apartments and replacing them with skyscrapers, parking garages, or surface parking lots. Roads in and out of the city center, as well as in many inner-city neighborhoods, were reconfigured to allow cars to move more quickly through neighborhoods and in and out of downtown. The faster the cars moved, the more quickly people abandoned the city for the suburbs. Dallas continued to hire acclaimed planners, like the Harvard-trained Vincent Ponte, to rethink and redraw its geography. Ponte suggested downtown connect its buildings with underground tunnels and glass skyways that clarified the urban environment by removing pedestrians from the streets. 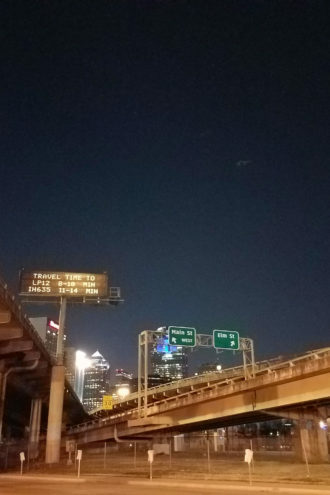 They were built, and downtown Dallas became a ghost town. In Dallas-Fort Worth, long-range planning continues to be dominated by the same old failed 20th century ideas and assumptions. These entrenched and misguided attitudes are reflected in the operations of the region’s powerful extra-governmental authorities. For example, the North Central Texas Council of Governments, the region’s transportation planning organization, directs billions in federal funding toward expanding and perpetuating a kind of un-urban urbanization. The faster the cars moved, the more quickly people abandoned the city for the suburbs. Dallas Area Rapid Transit sinks billions into a public transit strategy that presumes the unmovable, unquestioning necessity of car commuter-based urban development. These organizations, and many others, justify their short-sighted investments on what they call “regionalism.” But regionalism has become a code word for the blind support of a deeply flawed model of un-urban urban growth. 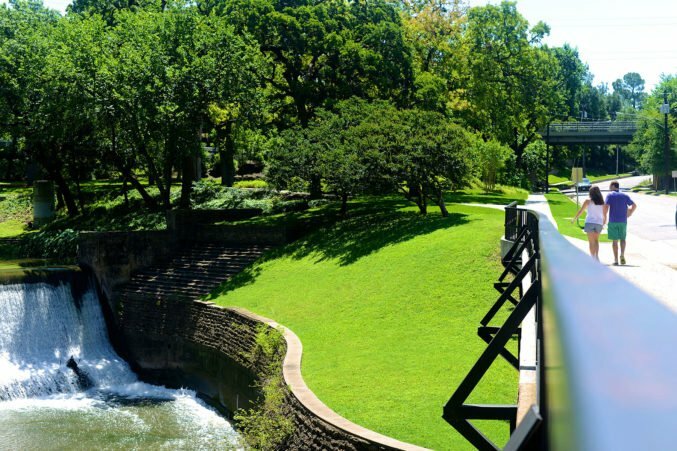 In 1908, the Trinity River flooded Dallas, and its leaders made a policy decision that would establish an economic development strategy for the next 100 years of its growth. Dallas-Fort Worth today faces a similar existential crisis, albeit a less visible one. New economic and environmental challenges will challenge the 21st century city, and it will require a new kind of city to rise to meet them. Dallas’ early attempts at replicating successful urban communities have been wildly inconsistent and generally disappointing. That too should not be discouraging. Rather, the history of Dallas’ development shows that the city is capable of tremendous vision and initiative. If that same civic ambition is applied to reimagining of its urban form – to breaking the degenerative cycle of sprawl and the outdated, dogmatic ideologies that underpin it – then the Dallas-Fort Worth region will enter into a new era of social, political, economic, and cultural possibility. All it will require is civic leaders who can muster the political courage to set a new course.